The princess was accompanied by a delegation from the foundation, chaired by Kingdom Holding Company Chairman Prince Alwaleed bin Talal. Princess Ameerah also met with Burkina Faso President Blaise Campaore at his presidential palace in Ouagadougou. She was received by Burkina Faso First Lady Chantal Campaore on arrival at Ouagadougou Airport. 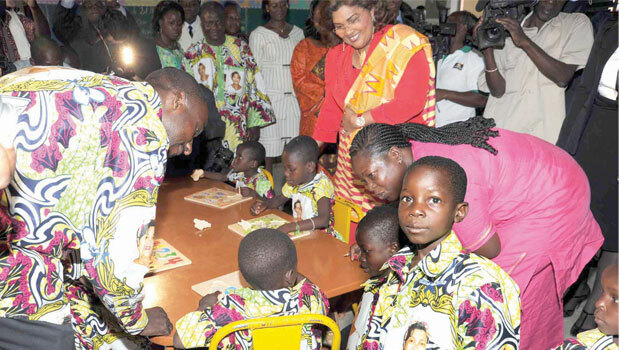 After inaugurating the children's village in Zinaire, Princess Ameerah and Campaore toured the facility and met with the orphans. An additional $50,000 donation by the foundation was announced on the occasion. In her speech, the princess said: “Today my joy is indescribable. Nothing warms our hearts more than seeing the fruits of our labor with our own eyes, witnessing how the Alwaleed bin Talal Village for orphans materialized. In 2006 Prince Alwaleed visited Burkina Faso and toured the construction site of the village. He was given honorary citizenship and a key to Ouagadougou. President Compaore had already made him a “Commander of the National Order,” Burkina Faso’s highest honor. In 2008, Alwaleed Bin Talal Foundation donated a further $400,000 toward the project.